Kombi is specially designed for international travelers, and alternative concept that goes a step further from a conventional Hostel. Kombi is a social & cultural meeting point where you will find internacional atmosphere and vanguardist design. With all the facilities: 24h reception, free WiFi, full equiped rooms, unlimited hot water, kitchen, free breakfast, bar & outdoor areas. We organize many cultural and night events during the week, offering to our guests free clubs entrance and all the recommendations to make your stay unforgettable. A place where culture, people and 'buena onda' gather together. 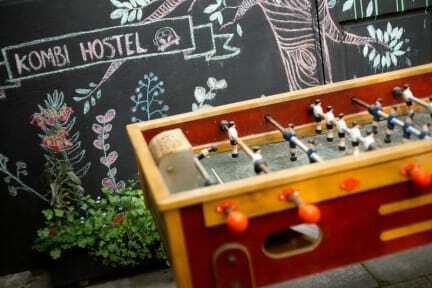 A hostel made of people for the people. We are located in Bellavista, one of the most emblematic neighborhoods in Santiago. 10 mins walking from a main Metro Station and very well comunicated with the airport and train /bus stations. You can find all the services you may need neraby (supermarket, pharmacy..). In Bellavista you will find modern & alternative art anywhere you walk, having a coffe in Patio Bellavista listening to life music, or walk up to Cerro San Cristobal will let you discover the magic of this particular neighborhood. Besides the cultural offer, this area has a quite active nightlife with a wide range of different clubs & pubs where you can try the typical Terremoto cocktail meanwhile listening to life Salsa, Funk, Cumbia or Rock n Roll. The staff were really friendly and helpful, rooms were spacious and had lockers for my valuables. The breakfast was basic but really good and the bathroom was huge. The location is great, right near the metro, San Cristobal Hill and heaps of places to eat and go out. Would definitely stay here again! I LOVED my stay at this hostel. It has such a cool atmosphere, lots of open common spaces, and hammocks :) Its location is great for young travelers and it’s so easy to meet other people from around the world. The staff were kind and organized. My only complaint is that the WiFi was really spotty! Kombi is a great value for 💰, especially for short stays at Santiago. Located at the great Bellavista barrio close to nice bars/cafés restaurants allows you to see the city easily. It is indeed a noisy hostel, located next to nightclubs, yet it is bearable wit earplugs. The facilities and breakfast are very basic, but the staff of the hostel is extremely helpful and they help maintain a high-level cleanness, which makes a difference. At night its a bit too Lord, because the hostel is located in the middle of the party area. Clean, comfortable rooms in a good location next to san Cristóbal hill, and the staff were really nice! I would've given it a better rating if it was cheaper, but for the price it was a bit inadequate. Overall pretty dirty, staff stayed up and made noise past 3am. Breakfast was half decent, no eggs but a good range of spreads. I was alone in a room and then a mother and her underage teenage girl we're checked in. I was extremely uncomfortable by them and as they were of me. A hostel isn't a place for a preteen girl and her dumb crackhead mother. The staff then had the audacity to say I was acting weird and making them uncomfortable and insulted my character. This place is joke.